M T D F e b r u a r y 2 0 1 9 32 B r a k e S e r v i c e lightweight suspension components made from materials like aluminum (instead of forged steel) and stiff sidewalls. In older vehicles, tire cupping suggests worn ride control components. However, low-profile tires and lightweight suspension materials are reducing instances of tire cupping. "You don't see tire cupping as oen as you used to on older vehicles that had heavier suspension components. Issues with ride control wear are showing themselves as accelerated tire wear," says Bacarella. "e tire may not have the large cupped areas but may be wearing more quickly. Even more evidence would be vibrations in the vehicle that aren't resolved even aer the tires are balanced properly." CONVERSION KITS Bacarella says kits that convert high-tech ride control components on later-model vehicles to standard shocks and springs are becoming popular as vehicles age. Technologies such as electronic adjustable suspensions, air leveling systems and self-leveling mechanical shocks are expensive to replace. "Sometimes tires are worn because the OE ride control components have failed and the customer doesn't want to spend the money to replace the OE-style, high-end units. 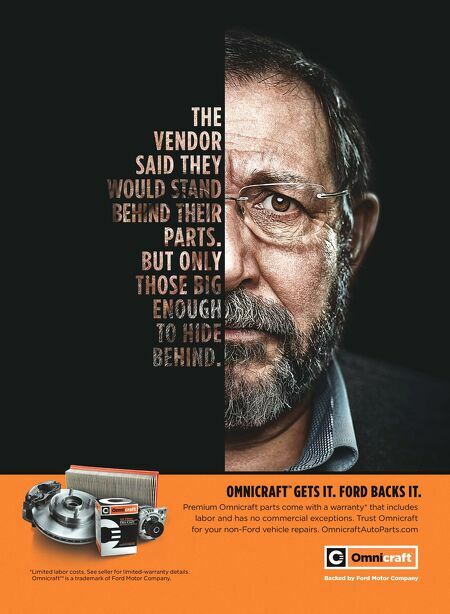 Monroe offers OE-style electronic replacement options as well as kits to convert the suspension to standard springs and premium aermarket replacement units based on the customer's needs." e conversion kits are easy to install, he says, and complete instructions for swap- ping the units are available at the Monroe website and YouTube channel. "Not only does the customer have new tires, but when the conversion kit is installed in place of worn units, the vehicle is more comfort- able and stable, plus components will last longer since the suspension is restored to the proper height." 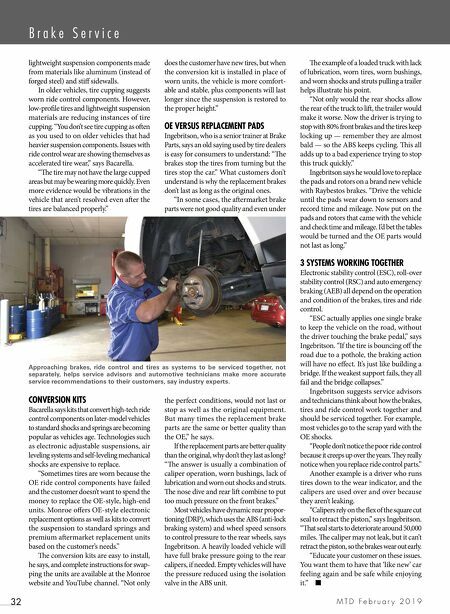 OE VERSUS REPLACEMENT PADS Ingebritson, who is a senior trainer at Brake Parts, says an old saying used by tire dealers is easy for consumers to understand: "e brakes stop the tires from turning but the tires stop the car." What customers don't understand is why the replacement brakes don't last as long as the original ones. "In some cases, the aermarket brake parts were not good quality and even under the perfect conditions, would not last or stop as well as the original equipment. But many times the replacement brake parts are the same or better quality than the OE," he says. If the replacement parts are better quality than the original, why don't they last as long? "e answer is usually a combination of caliper operation, worn bushings, lack of lubrication and worn out shocks and struts. e nose dive and rear li combine to put too much pressure on the front brakes." Most vehicles have dynamic rear propor- tioning (DRP), which uses the ABS (anti-lock braking system) and wheel speed sensors to control pressure to the rear wheels, says Ingebritson. A heavily loaded vehicle will have full brake pressure going to the rear calipers, if needed. Empty vehicles will have the pressure reduced using the isolation valve in the ABS unit. e example of a loaded truck with lack of lubrication, worn tires, worn bushings, and worn shocks and struts pulling a trailer helps illustrate his point. "Not only would the rear shocks allow the rear of the truck to li, the trailer would make it worse. Now the driver is trying to stop with 80% front brakes and the tires keep locking up — remember they are almost bald — so the ABS keeps cycling. is all adds up to a bad experience trying to stop this truck quickly." Ingebritson says he would love to replace the pads and rotors on a brand new vehicle with Raybestos brakes. "Drive the vehicle until the pads wear down to sensors and record time and mileage. Now put on the pads and rotors that came with the vehicle and check time and mileage. I'd bet the tables would be turned and the OE parts would not last as long." 3 SYSTEMS WORKING TOGETHER Electronic stability control (ESC), roll-over stability control (RSC) and auto emergency braking (AEB) all depend on the operation and condition of the brakes, tires and ride control. "ESC actually applies one single brake to keep the vehicle on the road, without the driver touching the brake pedal," says Ingebritson. "If the tire is bouncing off the road due to a pothole, the braking action will have no effect. It's just like building a bridge. If the weakest support fails, they all fail and the bridge collapses." Ingebritson suggests service advisors and technicians think about how the brakes, tires and ride control work together and should be serviced together. For example, most vehicles go to the scrap yard with the OE shocks. "People don't notice the poor ride control because it creeps up over the years. ey really notice when you replace ride control parts." Another example is a driver who runs tires down to the wear indicator, and the calipers are used over and over because they aren't leaking. "Calipers rely on the flex of the square cut seal to retract the piston," says Ingebritson. "at seal starts to deteriorate around 50,000 miles. e caliper may not leak, but it can't retract the piston, so the brakes wear out early. "Educate your customer on these issues. You want them to have that 'like new' car feeling again and be safe while enjoying it." ■ Approaching brakes, ride control and tires as systems to be serviced together, not separately, helps service advisors and automotive technicians make more accurate service recommendations to their customers, say industry experts.